I’m back! I didn’t realize it had been so long since I last post to Pretty Domestic. Frankly, I’ve missed my little creative outlet. All I can say is I’ve been busy. I started to title this post “Strike A Balance,” but Sunday’s are always reserved for “Champagne Sundays.” Here’s the thing, I’ve recently admitted to myself that I take on too much, with very little time left for me. On some level “me time” sounds selfish, but maintaining a healthy body, mind and spirit is critical, and every once in a while we all need to stop and recharge our batteries. Now mind you, recharging one’s batteries is relative. My recharge may be different from your’s, but we all need to take the time. I don’t want to be the Doll who’s constantly proclaiming how busy she is, but is completely run down and always running late ~ you know this woman. (I hate lateness, but that’s for another post.) Anywho, I’m back and feeling good. I’ve done a personal assessment and made a list of which commitments and activities I will keep and those in which to let go. Today is a recharge day. My family left the house in a whirlwind and here I am. I have everything I need, Gracie at my feet, my iPad, AppleTV, magazines, and so on and so on. It’s peaceful and I only have one committment this evening; but it’s one I enjoy. And yes, I’ll be home for the red carpet arrivals and Mr. Oscar. On to the most important part of this post. It’s Champagne Sundays, and what will be my cocktail of choice. 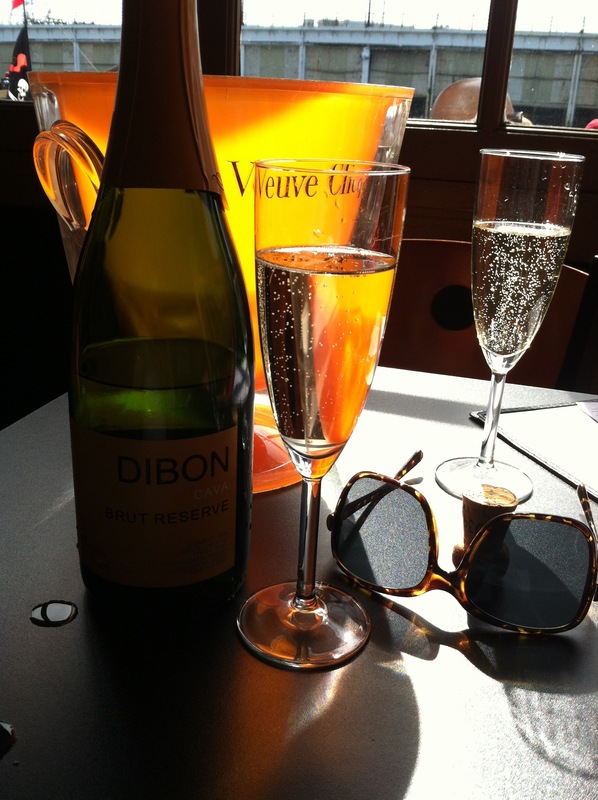 Today I’m thinking a simple Mimosa, but I’m going to use a Cava ~ Dibon is my favorite! Check out the champagne cocktail recipes below. Typically half sparkling wine and half fresh squeezed orange juice ~ for me it’s 70% sparkling topped with 30% orange juice. One cube of sugar, 2 dashes Angostura bitters topped with sparkling wine. Fill glass with half of mixture and top with sparkling wine. Mix sorbet and sparkling water or club soda in a bowl until it has dissolved. Add sparkling wine and fresh raspberries. Add ice if needed. I’m so glad to be back. I’ve missed Pretty Domestic and the Dolls that read my post. Here’s to you! « 21 Days & Counting ..
How appropriate. I am in the office reading this. Am rushing out though to have my own version of champagne Sunday, though.